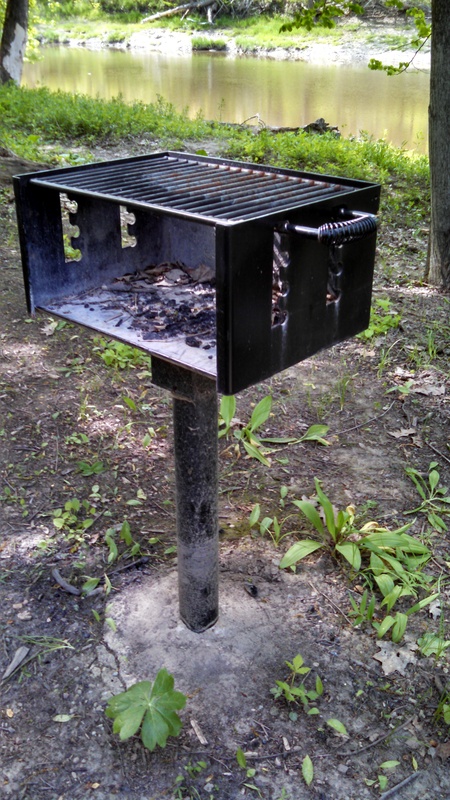 The grill at Baker Road Park had ramps growing next to it and several healthy ramp colonies nearby. Canoe-in campsites complete with picnic table, firewood, grill, benches and a toolbox filled with life’s necessities (TP, bug spray, lighter). What more could I ask? How about a tasty cluster of ramps growing right next to the grill? No problem. About the only thing missing was a mint under my pillow. 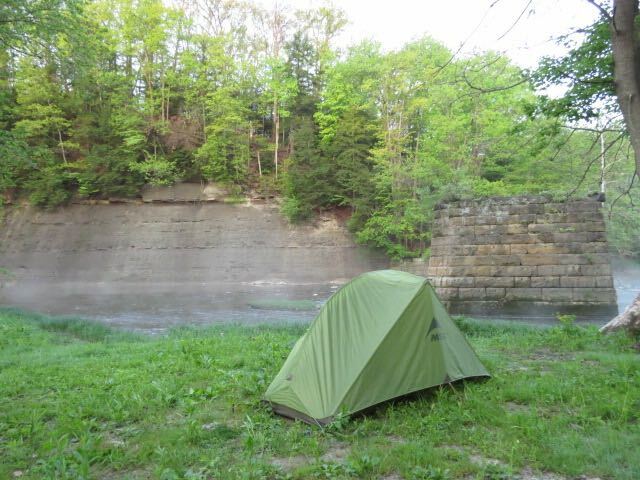 For this trip, one of my objectives was to try out the Lake MetroParks campsites accessible by water and recommend possible float trips for other paddlers. Two of the parks offer canoe-in camping, Riverview and Baker Road. A third canoe-in site is in the works. On a good day, add Lake Erie Bluffs into the mix. Literally on a good day, because the six-mile paddle over the open waters of Lake Erie requires a few hours of calm weather. That’s six miles as the crow flies. Following the contours of the shoreline would add a mile or so. Harpersfield to Painesville would make for a good overnighter with a stop at Riverview or Baker Road park. Riverview Park is eight miles downstream from Harpersfield and Baker Road Park is four miles further. It’s a long haul from Baker Road Park to Lake Erie (even without the six miles of open water). However, I found a good number of spots for low-profile, low-impact “wild camping” in that stretch. So it is possible to make a four-night trip of it, spending the last night at Lake Erie Bluffs. 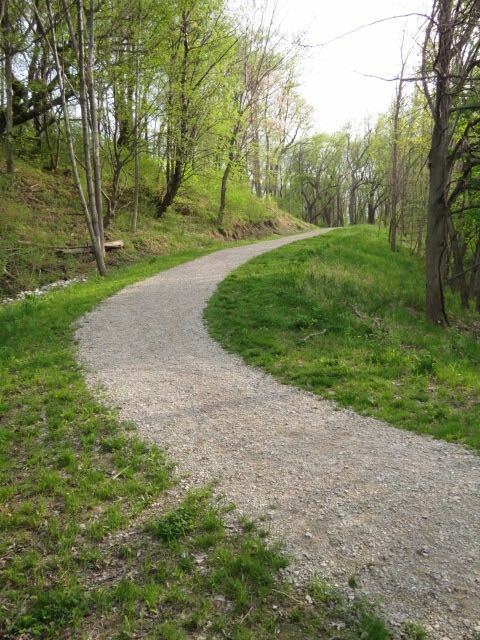 It’s an easy climb from the beach to the campsite at Lake Erie Bluffs. The latter makes for a great destination spot. In addition to an easy takeout — the beach and an gentle climb on a gravel path to the campsite — paddlers can bathe in the lake and enjoy ideal birding conditions. In addition to open water habitat, with eagles and osprey, there are mature woods, successional forest, edge habitat and open fields. For this trip, I opted to stay at the bluffs on the first night, then put in upstream and work my way down to Fairport Harbor, where Lake MetroParks has a well-appointed beachfront facility. Camping is $20 a night, $10 for Lake County residents. Campsites must be reserved in advance by phone or online. Park district employees were very helpful. Educational programs director Brian Fowler gave me a detailed rundown over the phone on what to look for along the river. As mentioned in a previous post, while I was camped at Lake Erie Bluffs, one of the park rangers called me on my cellphone to advise me of hazardous weather. The only downside to camping at Riverview and Baker Road parks is the persistent highway sounds. However, at Riverview Park, the traffic on State Route 528 tapered off in the evening. At Baker Road, I-90 is far enough away that the traffic sounds weren’t too terribly annoying. In either case, a quality set of earplugs can make for a good night’s sleep. My personal recommendation is Leight Sleepers, made by Sperian Hearing Protection, LLC. Right now, some of you are thinking, “If you’re wearing earplugs, you might not hear a bear trying to sneak up on your tent.” That’s a tradeoff some of us are willing to accept — being eaten by a bear for the sake of a good night’s sleep. 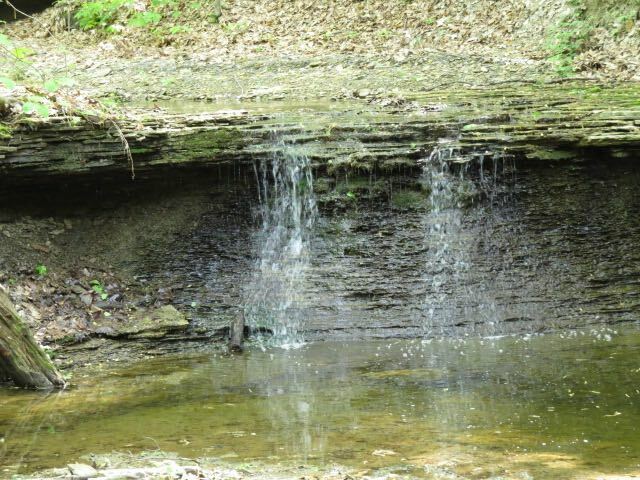 One of the waterfalls at Baker Road Park. Mighty inviting after a hot day on the river. I particularly enjoyed Baker Road Park, where the campsite is about 3/4 mile from the parking lot. It’s a great place to explore, with mature forest, vernal pools, waterfalls and large open field for nighttime stargazing. Riverview is much smaller and situated at the terminus of a dead-end road. Regardless, I’d highly recommend either park as well as Lake Erie Bluffs. Even without a mint under the pillow.